[YM Archetype] Grand Dragons, The Adorable Dragon's Predecessors! After quite some time of refinement, I present to you the 1st run of support for my new archetype! Back in 2014, I posted an archetype w/ full lore based on the "Deletors" project (even though my entry got rejected), which was the Zefras of DP, in that they combined many beloved archetypes! In that lore, the Grand Dragons preceded the Syntheticals, which took form into this Dragon Pendulum archetype! Like the RWBY archetype, there will be several strings of support included overtime. Once I decide the archetype has been finished, I will post it publicly to DP. Hope you all enjoy! - 3/30/16: Archetype Posted on Duel Portal Forums! The Syntheticals are a breed of hyper-intelligent dragons that were raised in an isolated Solar System, which the Negators nicknamed “Excess”, referring to the planet’s wealth of natural resources. Each plain of land is split between the four major elements: Water, Wind, Earth, and Fire. These elements were retained in their purest states, before the invasion of the Negators. Each faction of the lands was controlled by the Grand Dragons, whom were all controlled under the Tier Dragon which controlled both the Darkness and the Light within this space, forming an unusual harmony of all elements. The planet was stumbled upon the crossfire of the war-ridden Light and Dark factions, and due to this, became a battleground for each side attempting to horde the resources. The Grand Dragons attempted to ward off the danger, yet sadly, could not combat the highly refined and weaponized threats, and were killed off before becoming corrupted. The children of these Grand Dragons hid within the core of the planet, hibernating away from the imposing threats conquering their planet… all except 1. This young dragon was the offspring of the Darkness and the Light, raised by the Tier Dragon, and a mutt that was highly desired by the Negators, for its unique abilities to discern the locations of both Light and Dark entities in a given area. After successfully conquering the planet "Excess", the Negators corrupted and trained this young offspring to bend to their whim, falling prey to the Negator’s sickening conquests. Yet, it still stayed conscious, desiring the company of its friends, tripping over a grey and bleak area as the young dragon attempted to stay pure to return to her former state. Until the day has come, the remaining young dragons will rest in the womb of their planet, synthesizing with the unnatural elements spewed across the industrialization of its surface, and evolving to combat this interstellar threat known as the Negators. Pendulum Effect: You cannot Pendulum Summon monsters, except Dragon-Type monsters. This effect cannot be negated. 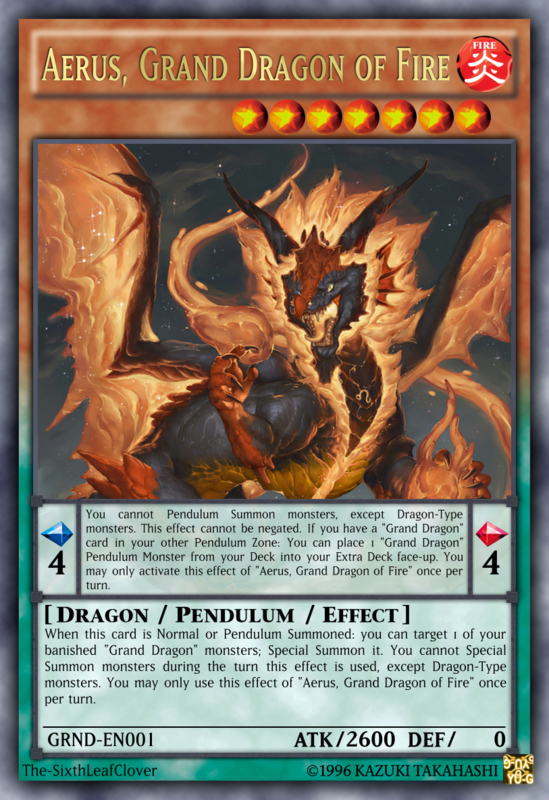 If you have a "Grand Dragon" card in your other Pendulum Zone: You can place 1 "Grand Dragon" Pendulum Monster from your Deck into your Extra Deck face-up. You may only activate this effect of "Aerus, Grand Dragon of Fire" once per turn. Monster Effect: When this card is Normal or Pendulum Summoned: you can target 1 of your banished "Grand Dragon" monsters; Special Summon it. You cannot Special Summon monsters during the turn this effect is used, except Dragon-Type monsters. You may only use this effect of "Aerus, Grand Dragon of Fire" once per turn. 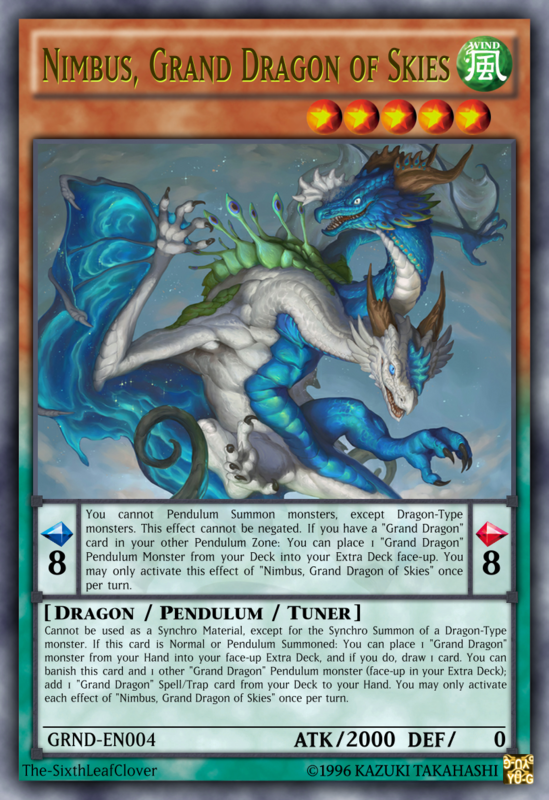 Pendulum Effect: You cannot Pendulum Summon monsters, except Dragon-Type monsters. This effect cannot be negated. 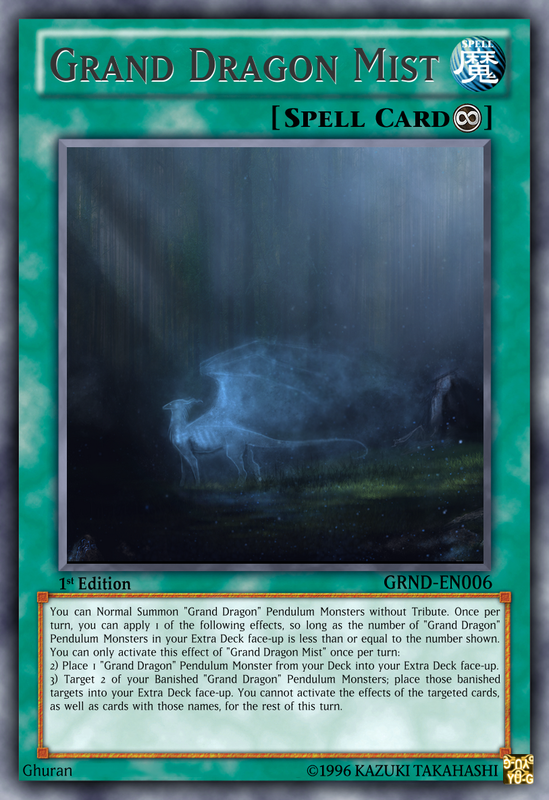 If you have a "Grand Dragon" card in your other Pendulum Zone: You can place 1 "Grand Dragon" Pendulum Monster from your Deck into your Extra Deck face-up. You may only activate this effect of "Fiora, Grand Dragon of Water" once per turn. Monster Effect: When this card is Normal or Pendulum Summoned: you can target up to 2 "Grand Dragon" monster you control, then declare a level between 1 - 10; the declared target's original levels become the declared level. You cannot Special Summon monsters during the turn this effect is used, except Dragon-Type monsters. You may only use this effect of "Fiora, Grand Dragon of Water" once per turn. Pendulum Effect: You cannot Pendulum Summon monsters, except Dragon-Type monsters. This effect cannot be negated. 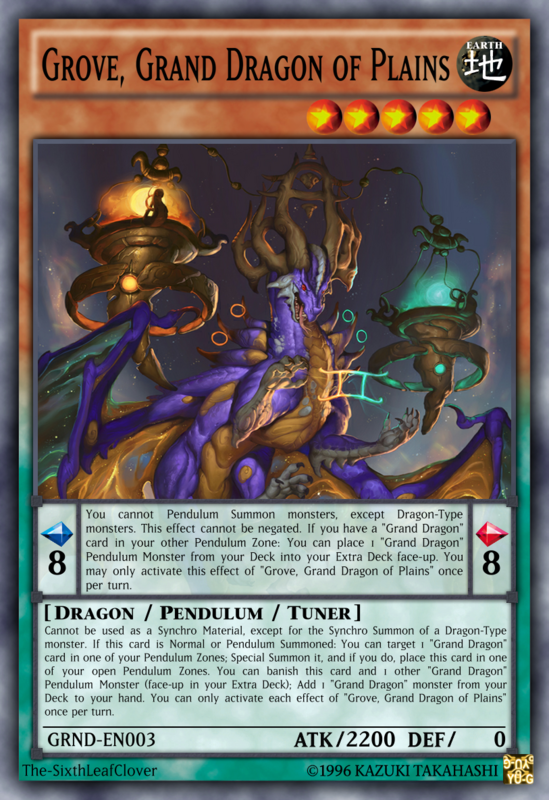 If you have a "Grand Dragon" card in your other Pendulum Zone: You can place 1 "Grand Dragon" Pendulum Monster from your Deck into your Extra Deck face-up. You may only activate this effect of "Grove, Grand Dragon of Plains" once per turn. Monster Effect: Cannot be used as a Synchro Material, except for the Synchro Summon of a Dragon-Type monster. If this card is Normal or Pendulum Summoned: You can target 1 "Grand Dragon" card in one of your Pendulum Zones; Special Summon it, and if you do, place this card in one of your open Pendulum Zones. You can banish this card and 1 other "Grand Dragon" Pendulum Monster (face-up in your Extra Deck); Add 1 "Grand Dragon" monster from your Deck to your hand. You can only activate each effect of "Grove, Grand Dragon of Plains" once per turn. Pendulum Effect: You cannot Pendulum Summon monsters, except Dragon-Type monsters. This effect cannot be negated. 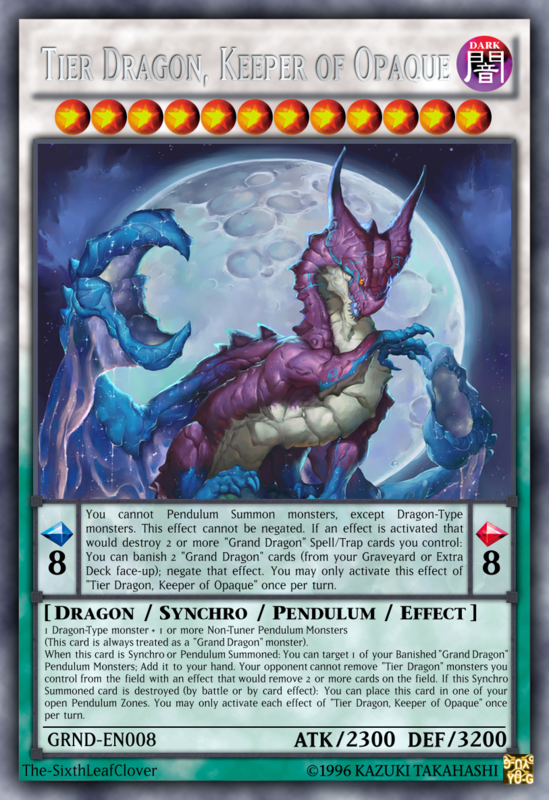 If you have a "Grand Dragon" card in your other Pendulum Zone: You can place 1 "Grand Dragon" Pendulum Monster from your Deck into your Extra Deck face-up. You may only activate this effect of "Nimbus, Grand Dragon of Skies" once per turn. Monster Effect: Cannot be used as a Synchro Material, except for the Synchro Summon of a Dragon-Type monster. If this card is Normal or Pendulum Summoned: You can place 1 "Grand Dragon" monster from your Hand into your face-up Extra Deck, and if you do, draw 1 card. You can banish this card and 1 other "Grand Dragon" Pendulum monster (face-up in your Extra Deck); add 1 "Grand Dragon" Spell/Trap card from your Deck to your hand. You may only activate each effect of "Nimbus, Grand Dragon of Skies" once per turn. Pendulum Effect: You cannot Pendulum Summon monsters, except Dragon-Type monsters. This effect cannot be negated. 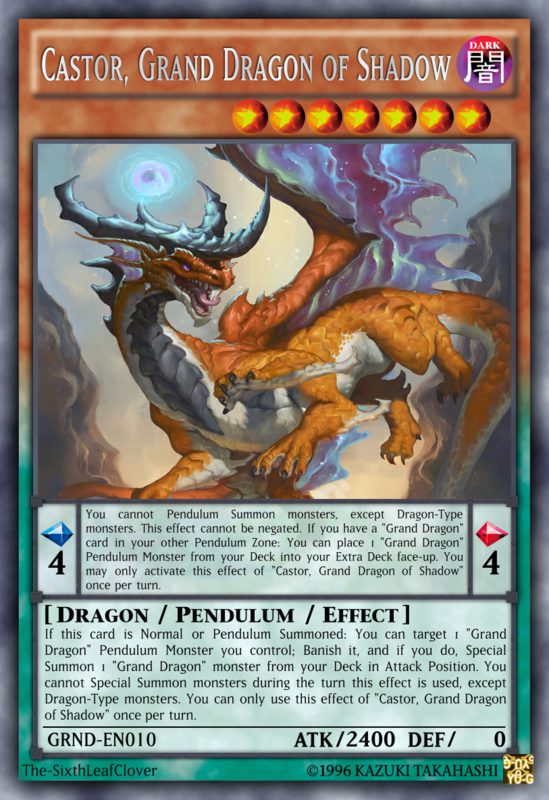 If you have a "Grand Dragon" card in your other Pendulum Zone: You can place 1 "Grand Dragon" Pendulum Monster from your Deck into your Extra Deck face-up. You may only activate this effect of "Aurora, Grand Dragon of Light" once per turn. Monster Effect: Cannot be used as a Synchro Material, except for the Synchro Summon of a Dragon-Type monster. 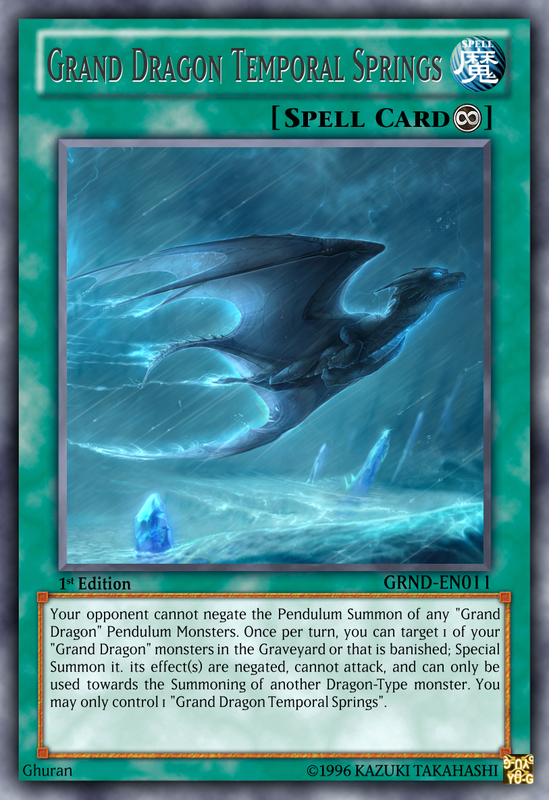 If this card is Normal or Pendulum Summoned: You can send 1 "Grand Dragon" Pendulum Monster and/or 1 "Grand Dragon" Spell/Trap card from your Deck to the Graveyard. You can banish this card and 1 other "Grand Dragon" Pendulum Monster (from your Extra Deck face-up), then target 1 "Grand Dragon" card in your Graveyard; Add it to your hand. You may only activate each effect of "Aurora, Grand Dragon of Light" once per turn. Pendulum Effect: You cannot Pendulum Summon monsters, except Dragon-Type monsters. This effect cannot be negated. 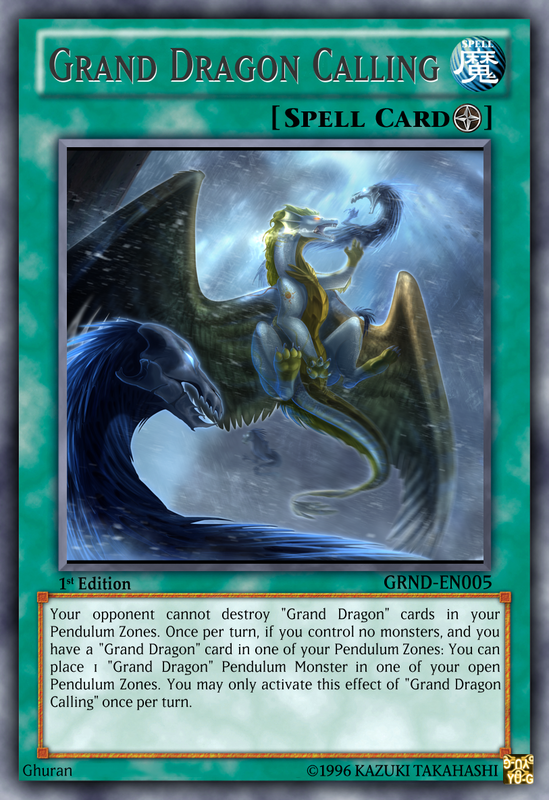 If you have a "Grand Dragon" card in your other Pendulum Zone: You can place 1 "Grand Dragon" Pendulum Monster from your Deck into your Extra Deck face-up. You may only activate this effect of "Castor, Grand Dragon of Shadow" once per turn. 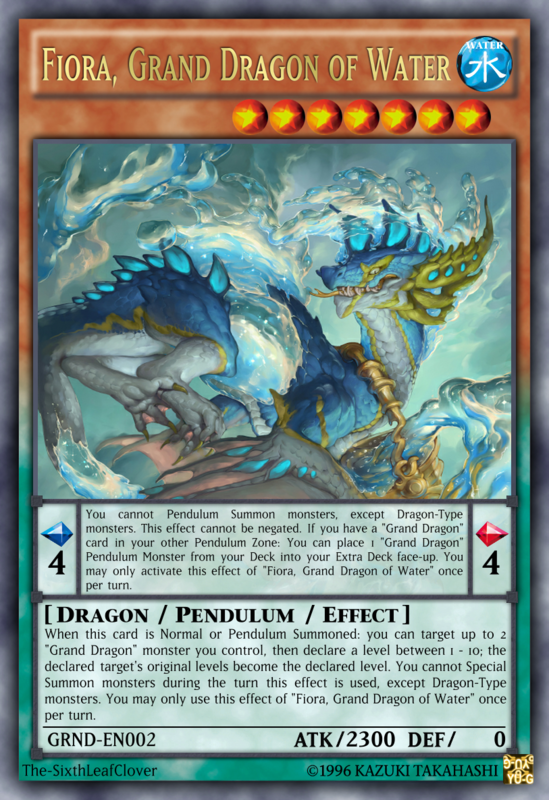 Monster Effect: If this card is Normal or Pendulum Summoned: You can target 1 "Grand Dragon" Pendulum Monster you control; Banish it, and if you do, Special Summon 1 "Grand Dragon" monster from your Deck in Attack Position. You cannot Special Summon monsters during the turn this effect is used, except Dragon-Type monsters. You can only use this effect of "Castor, Grand Dragon of Shadow" once per turn. Pendulum Effect: You cannot Pendulum Summon monsters, except Dragon-Type monsters. This effect cannot be negated. If an effect is activated that targets 2 or more "Grand Dragon" Spell/Trap cards you control: You can banish 2 "Grand Dragon" cards (from your Graveyard or Extra Deck face-up); Negate that effect. You may only activate this effect of "Tier Dragon, Keeper of Luminosity" once per turn. (This card is always treated as a "Grand Dragon" card). When this card is Synchro or Pendulum Summoned: You can target 1 "Grand Dragon" Pendulum Monster in your Graveyard; Add it to your hand. "Tier Dragon" monsters you control cannot be targeted by an opponent's effect that targets exactly 1 card on the field. If this Synchro Summoned card is destroyed (by battle or by card effect): You can place this card in one of your open Pendulum Zones. You may only activate each effect of "Tier Dragon, Keeper of Luminosity" once per turn. 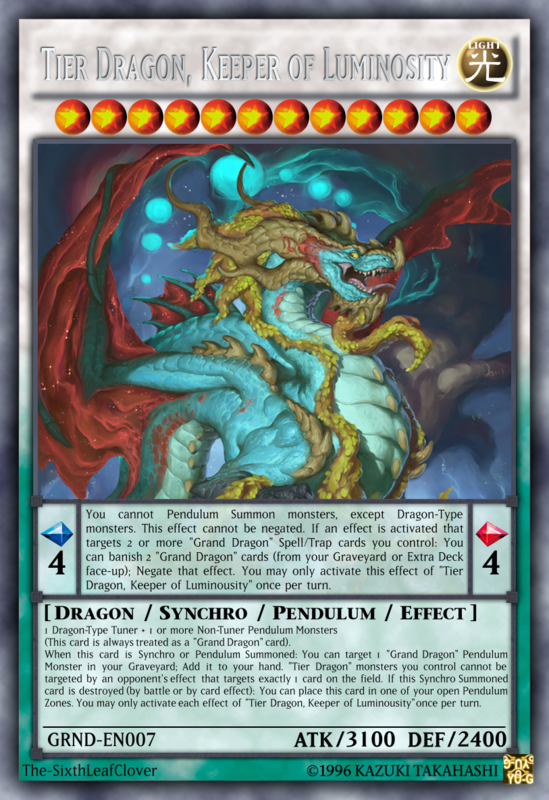 Pendulum Effect: You cannot Pendulum Summon monsters, except Dragon-Type monsters. This effect cannot be negated. If an effect is activated that would destroy 2 or more "Grand Dragon" Spell/Trap cards you control: You can banish 2 "Grand Dragon" cards (from your Graveyard or Extra Deck face-up); negate that effect. You may only activate this effect of "Tier Dragon, Keeper of Opaque" once per turn. (This card is always treated as a "Grand Dragon" monster). When this card is Synchro or Pendulum Summoned: You can target 1 of your Banished "Grand Dragon" Pendulum Monsters; Add it to your hand. Your opponent cannot remove "Tier Dragon" monsters you control from the field with an effect that would remove 2 or more cards on the field. If this Synchro Summoned card is destroyed (by battle or by card effect): You can place this card in one of your open Pendulum Zones. You may only activate each effect of "Tier Dragon, Keeper of Opaque" once per turn. 2) Place 1 "Grand Dragon" Pendulum Monster from your Deck into your Extra Deck face-up. 3) Target 2 of your Banished "Grand Dragon" Pendulum Monsters; place those banished targets into your Extra Deck face-up. You cannot activate the effects of the targeted cards, as well as cards with those names, for the rest of this turn. Effect: Your opponent cannot destroy "Grand Dragon" cards in your Pendulum Zones. 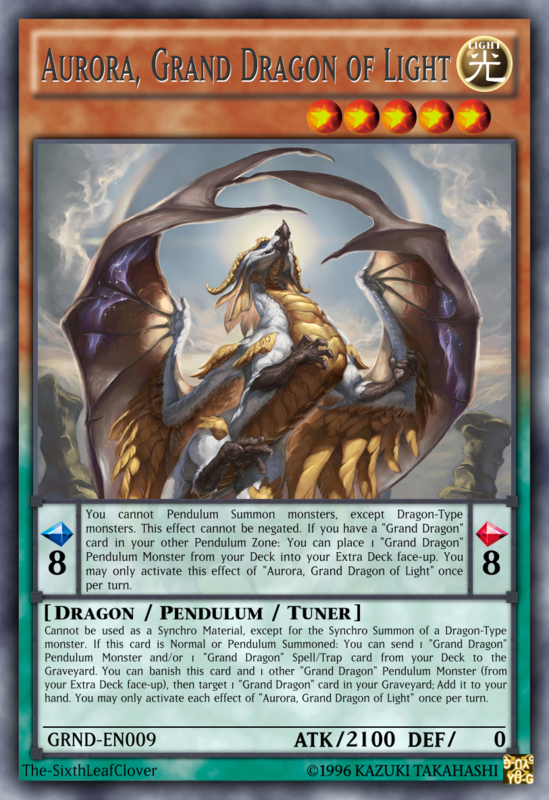 Once per turn, if you control no monsters, and you have a "Grand Dragon" card in one of your Pendulum Zones: You can place 1 "Grand Dragon" Pendulum Monster in one of your open Pendulum Zones. You may only activate this effect of "Grand Dragon Calling" once per turn. Effect: Your opponent cannot negate the Pendulum Summon of any "Grand Dragon" Pendulum Monsters. Once per turn, you can target 1 of your "Grand Dragon" monsters in the Graveyard or that is banished; Special Summon it. its effect(s) are negated, cannot attack, and can only be used towards the Summoning of another Dragon-Type monster. You may only control 1 "Grand Dragon Temporal Springs". *Added 3 new cards: Aurora, Grand Dragon of Light, Castor, Grand Dragon of Shadow, and Grand Dragon Temporal Springs. *Lvl. 5 Grand Dragons can no longer be Normal Summoned without Tribute. *Tier Dragon of Luminosity, and Tier Dragon of Opaque had their Summoning effects swapped (Now Luminosity targets Grave, and Opaque targets Banished).